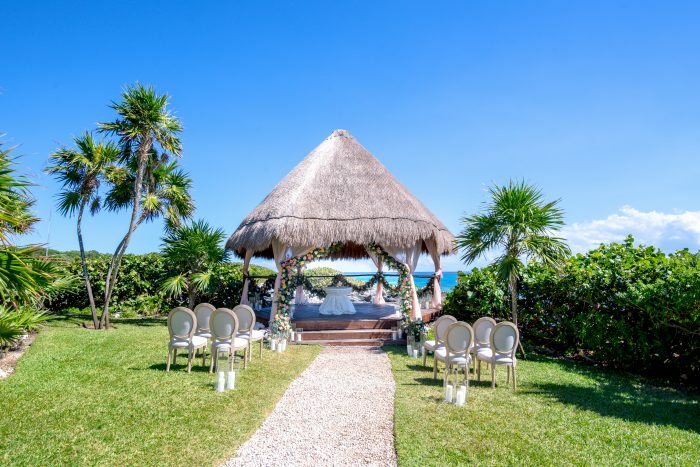 Surrounded by Mayan Ruins and tropical jungles, this luxury hotel is the perfect place for those who want a special and over the top romantic wedding ceremony. The resort is located on a private bay in the Riviera Maya. It features riverbed formations and uniquely shaped outdoor pools so your wedding ceremony will be effortlessly beautiful. 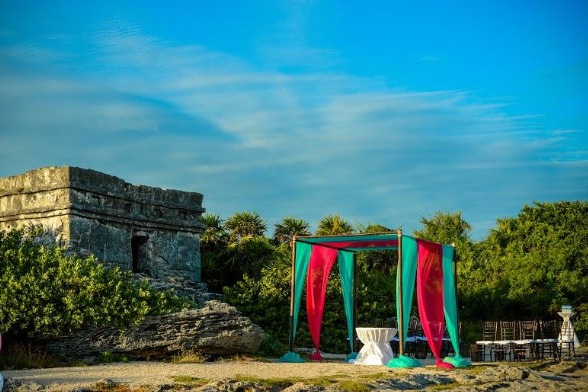 You even have the choice of the historical Mayan Ruins as the background for your wedding ceremony! Your destination wedding will feel like paradise with the Mediterranean style decor placed all along the subterranean rivers that flow through the property. The resort is next to an eco-archeological park that offers more than 40 cultural attractions and expositions on art and traditions in Mexico. There are 11 restaurants, including 5 international a-la-carte restaurants, and 10 bars, so this is the perfect place for foodies and adventurous eaters! You’ll see all sorts of wildlife and exotic animals from the resort with jungles and rainforests in the surrounding areas. The base price for this package is $1525, but complimentary when booking 10 deluxe room categories for a minimum of 5 nights at the resort. Upgraded packages, additional guests, and add-ons are available for an additional cost. Garden Gazebo – 100 guests max, Mayan Ruins – 60 guests max. The resort will host no more than 1 wedding per day, Monday thru Saturday. Ceremonies will be held at 4pm, 4:30pm, or 5pm. Rooms range from $140 – $180 per person per night. Every room includes a minibar and hot tub. Wifi is available with extra charge. Children 2 and younger stay free. There are 764 total guest rooms with views of the pool, jungle, or garden. High-season months typically include January, February, March, April, July, August, November, and December. It is always encouraged to have your guests book their stay 8 – 12 months in advance. All rooms allow up to 2 adults and 2 children max, or 3 adults max. Children are ages 12 and younger. 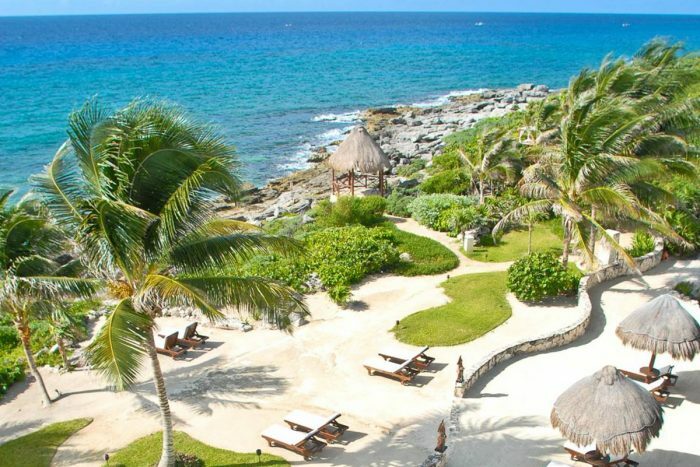 Occidental Xcaret is located about 35 miles from the CUN airport. The resort is about 10 minutes outside of downtown Playa del Carmen. 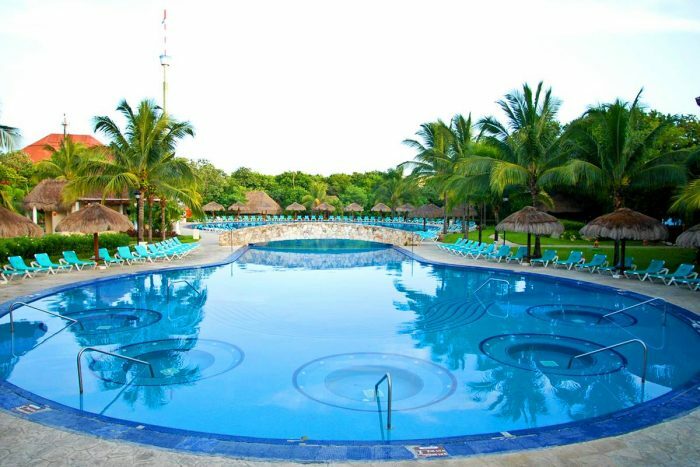 Occidental Xcaret is located 35 miles from the CUN airport. The resort is about 10 minutes outside of downtown Playa del Carmen. 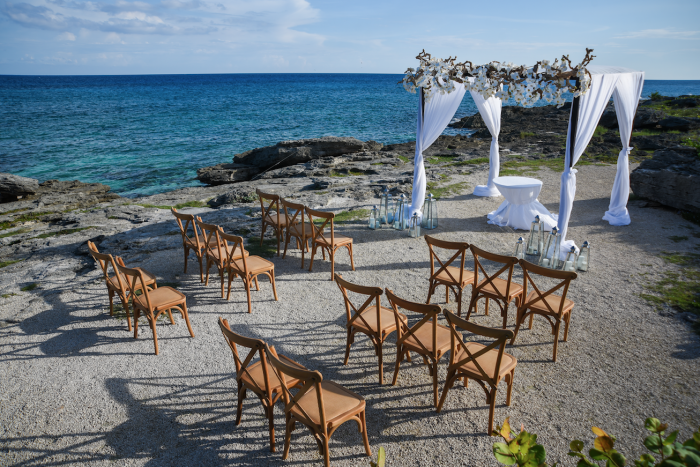 Q: What makes Occidental Xcaret such a great place for a destination wedding? A: It is a perfect places for those looking for adventure, nature, luxury and history. These elements make our resort a great place. Q: What are the challenges brides face when planning their destination wedding at Occidental Xcaret? A: We have high chances to be sold out since we are located in a very privileged area, and that is why we have many visitors all year long. A: The challenge to bring to life all the requests and expectations of the brides!